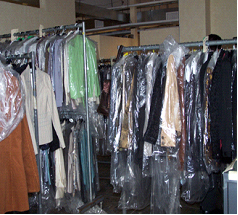 Our two whirlwind days in New York began with an organized tour in the Garment District with Tightwad Treks (Elegant Tightwad Shopping Excursions). 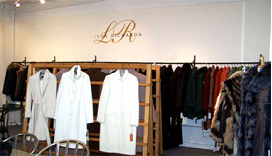 As soon as we stepped off our Midwest Airlines flight at La Guardia, we called Pam Parisi, the tour diva, to arrange our meeting at the first showroom, Linda Richards on West 38th Street. Here we found very high quality coats, suits, jackets and more — bound for the biggest of the big-name New York stores. Current and next season items were available for purchase — all at a substantial (I mean SUBSTANTIAL) savings over retail. She also had about 300 pairs of one-of-a-kind Bettye Muller designer sample shoes selling for $75/pair instead of the $300-$400 retail price. These are the kind of shoes sold at Bergdorf Goodman and other top stores. (She does not always have shoes. Her employees are not yet “cutting” for next season, so the shoes were displayed on the cutting table. But if they are cutting, you can see them in action. Linda Richards, like the other designer showrooms we visited, is not open to the public. But she does offer a public sample sale during the week before Easter and the week before Thanksgiving. We visited another 6 or 7 showrooms, most small but most intriguing. None of them sell retail to the public, and most do not want their names used. But the styles covered a wide range from chic and sassy to classic. Sizes available were primarily sample sizes. One shop actually purchases designer items from retailers, copies the designs and then makes their own patterns to create copies. A few shops had accessoires, belts and purses — but for a better selection, take the Accessories Tour. Back Fashion Cult. I think the most fun showroom was that of Back Fashion Cult, owned by a very nice woman named Sihan. She had funky, chic and very fun clothing and accessories, primarily French and Italian lines. A woman from Dallas was on our tour with her 17-year-old daughter. Their mission was to find a memorable prom dress. Sihan had dozens to show her and every dress the young woman tried on looked absolutely terrific. No girl in Texas will have a dress quite like she will as Sihan’s clothing is unique, sophisticated and totally unlike any traditional prom dresses you’d find on department store racks. 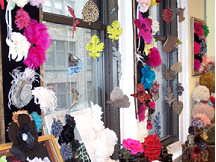 One more workroom/showroom of interest was M&S that made custom fabric flowers for couture apparel, bridal, millinery and home decor markets. We loved the tour. Pam and her assistant tour leader, Pilar, were wonderfully accommodating as they tried to recommend showrooms that suited the interests of the people on the tour. I’d definitely take the tour again! 1) Plan Your Tour. If you have enough women, ask for a private tour. That way you can go to the showrooms most suited to your style, size and fashion sense. But if you go with multiple generations in your group (Grandma, 40-somethings and teenagers), you’ll find that every showroom will not suit everyone in your group. Go with women of similar age and taste and you’ll be happier. 2) Talk to Pam Before Your Tour. Give her an idea of what you might be looking for — an evening dress, business suit, casual, funky, tiny sizes or mature sizes, etc. 3) A Variety of Tours. Tightwad Treks also offers an Uptown Consignment Crawl, an Accessory Addict Tour, Vintage Clothing Shop Tour and a Downtown Diva Tour. 4) Tour Prices. Tour prices start at $45 for a 2-hour tour. Ours was $90 for a 4-hour tour. Pam also gives information about current sales that you can attend on your own after the tour. And she gives each participant a copy of her book.